Kodak, the brand which is known for presenting us the Kodak moments since many years is finally setting its footstep in the world of gadgets. 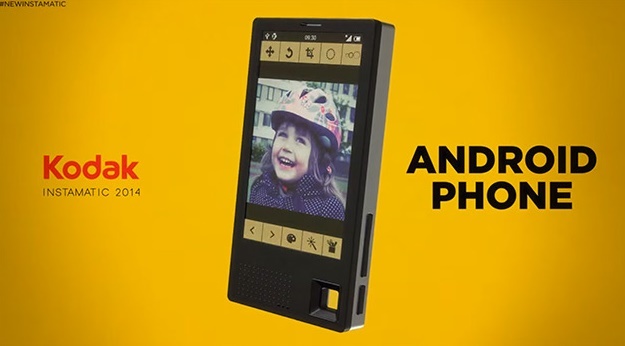 Yes, news report that Kodak is planning for launching a smartphone, probably an Android one. The image you see below is definitely not a real one. Neither does it bear any faintest similarity. The image is all fun and imagination (Courtesy: The Engadget). Now it seems queer how Kodak suddenly thought of entering in this magnum world of gadgets with no previous records. It has been reported that Kodak is not going to develop the devices itself. Rather, an English company named Bullitt, who is known for making the Caterpillar phones, are developing the Kodak phones. Not much detail has been provided but it can be expected that some special focus will be given on photography, or rather say, camera specs. But not a single feature regarding sensor sizes, lens apertures or dedicated imaging hardware has been mentioned. So now, the only option is to wait and watch till the CES arrives.